A 32 year old male was carrying a heavy pipe overhead with his right arm and slipped falling forward, onto the right side. He notes pain in the right shoulder, worse with any movement. His right arm is flexed and internally rotated for comfort. A bedside ultrasound of the right shoulder is performed, what is the next best step in management? Shoulder dislocation reduction. 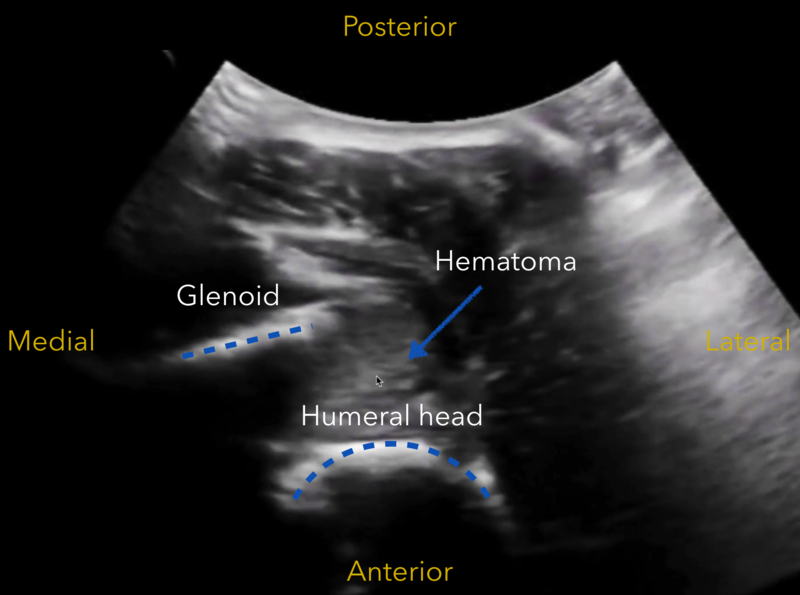 The ultrasound image shows anterior displacement of the humeral head with respect to the glenoid fossa consistent with an anterior shoulder dislocation. A hematoma is also noted within the joint space which is very commonly associated with a traumatic shoulder dislocation. Ultrasound is useful for both the initial diagnosis and reduction confirmation of a shoulder dislocation, as well as for intra-articular injection of local anesthetic; however in a traumatic dislocation, an initial x-ray should be obtained to evaluate for any associated fracture. To perform the exam, a low frequency curvilinear transducer should be used. The operator should stand behind the patient, on the side of the affected shoulder, and place the ultrasound system directly in front of the patient for easy visualization. 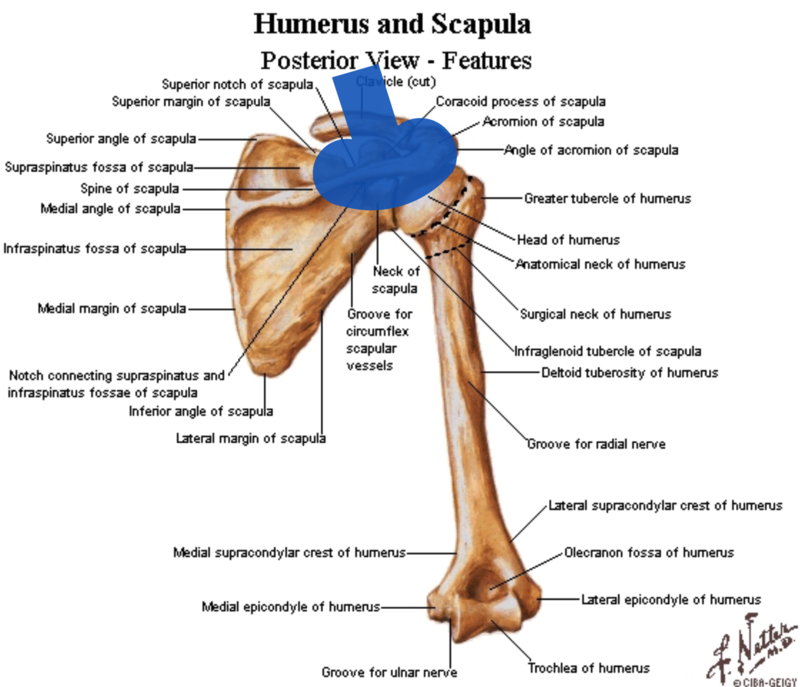 The probe should be placed on the posterior aspect of the scapula, parallel and just inferior to the scapular spine. This will allow direct visualization of the glenohumeral joint. Proper probe placement for evaluation of glenohumeral joint. 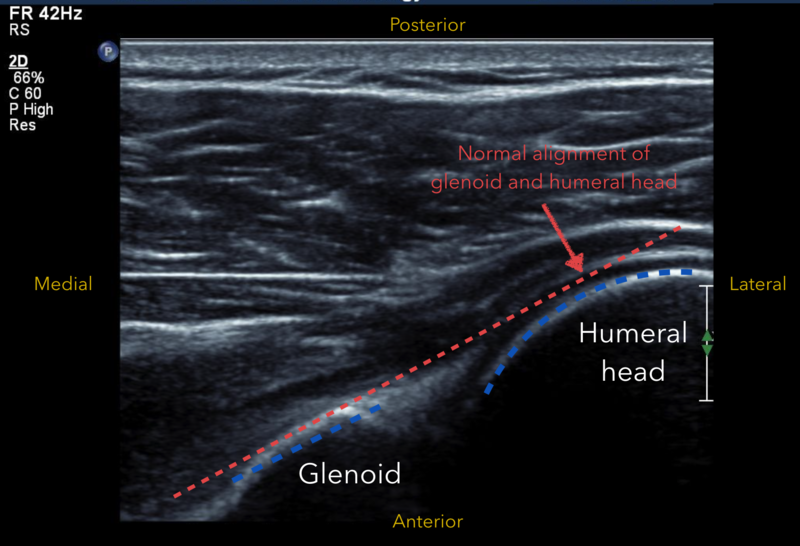 In a normal shoulder the glenoid and humeral head articulate nicely and this can be appreciated on ultrasound with internal and external rotation of the patient's arm, however with dislocation, the humeral head and glenoid will not be aligned. In anterior dislocation, the humeral head will be deep to the glenoid, while in a posterior dislocation, the humeral head will be more superficial to the glenoid. Ultrasound is especially useful to confirm successful shoulder relocation and prevent both a prolonged stay in the emergency department waiting for a post reduction x-ray, as well as re-sedation if this was required for a difficult shoulder reduction. Lastly, this same ultrasound view can be used for in-plane needle guidance to provide intra-articular anesthesia using a lateral needle entry approach. For a 5 minute video tutorial on ultrasound for shoulder dislocation , click here to watch this excellent video at 5 Minute Sono. Abbasi S, Molaie H, Hafezimoghadam P, et al. Diagnostic accuracy of ultrasonographic examination in the management of shoulder dislocation in the emergency department. Ann Emerg Med. 2013:1-6.